Hi, my name is Linda Newman and I am 54 and live in Omaha, Nebraska. I ride a TerraTrike Zoomer outfitted with Axiom bags that I use for commuting back and forth to work during the spring, summer and fall. I just can’t bear to get it out in the winter snow, salt and slush and risk it getting ruined. Other than the bags and some lights I really haven’t done any customizing… I haven’t really needed to as the trike has everything I want already on it. My husband William and I both have one, and we commute to work on them together. We previously commuted on our regular recumbent bikes but it was hard stopping at street lights, balancing on my tiptoes and then trying to quickly get my foot up and get clipped in and going when the light turned green. 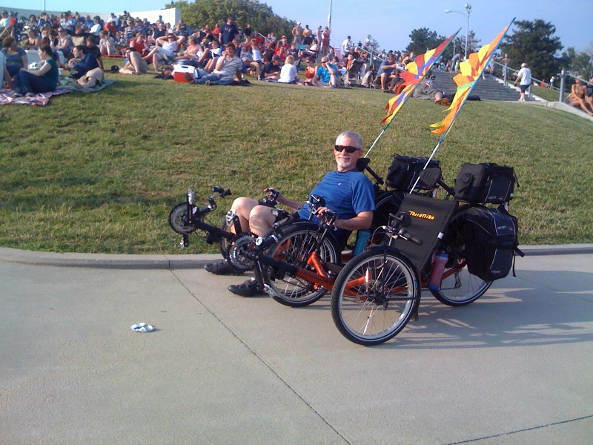 I feel so much more confident and relaxed when riding my trike as I don’t have to worry about keeping my balance, and I can ride up hill as slow as I want with out worrying about falling over. The seating position is great as I can look around and watch the world pass by with ease. This is a method of keeping in shape that I expect to be able to do well into my retirement years! My name is William Newman. 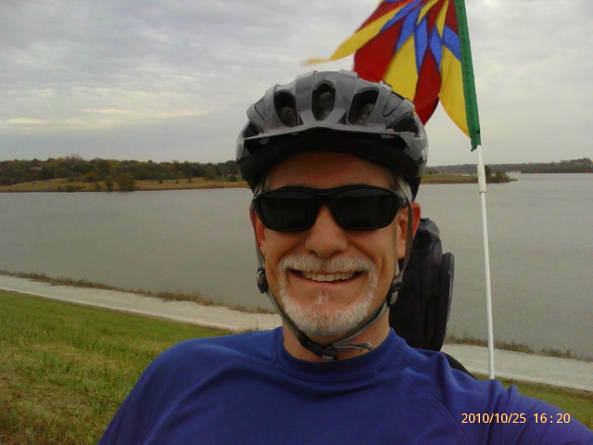 I’m also 54 years old, live in Omaha, Nebraska, and am a League of American Bicyclists League Certified Instructor. So, as you can imagine, I’ve had a lot of bikes over the years and have a real love of cycling. 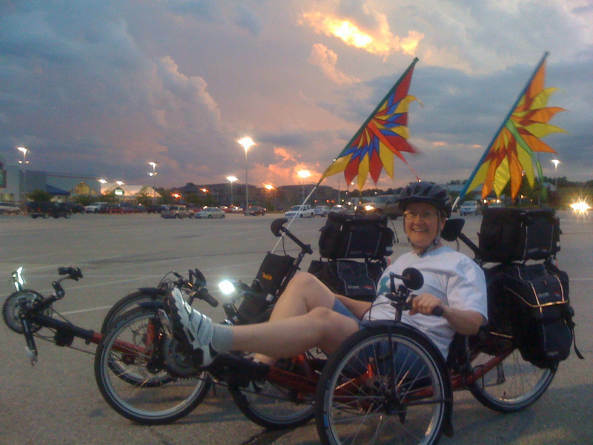 In 2002 my wife and I purchased a couple of Lightning P-38 recumbent bicycles from Lightning Cycle Dynamics in California as we were looking for something more comfortable, lightweight and fun to ride. We were also tired of wrist and lower back pain that is so common on an upright bike. 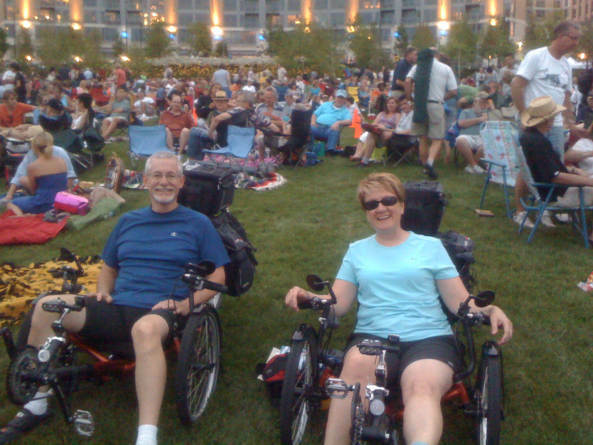 We really loved our recumbent bikes and a couple of years ago began using them for commuting to and from work. The only down side was stopping at street lights, unclipping and trying to balance the bikes while stopped as the seat height requires using your tiptoes or leaning over to one side. 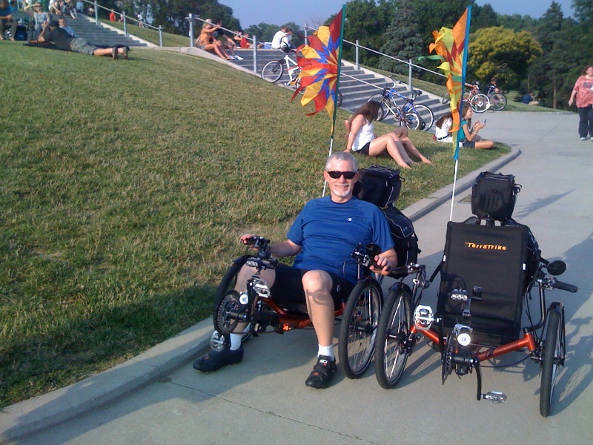 So, after a couple of years of that we started looking at recumbent trikes so we could keep the comfortable seating position we loved, but add a sturdy, stable feel with an easy stopping and starting ability. After reviewing some different types we settled on the TerraTrike as we liked the adjustable seat recline ability to allow us to sit more upright when riding. We received our TerraTrike Zoomers the end of June, 2010 and began using them every chance we got. We used them for commuting to and from work, for riding to summer concerts in the area parks, attending cycling events, exercise and when ever time permitted, just for fun! I love the stability, and the fact that no matter where I ride, I already have a comfortable chair with me, and that the nice Axiom rear bag and rear panniers can carry my work clothes, laptop, and lunch (or for an evening concert at the park, a bottle of wine, wine glasses, plates and some cheese and crackers). We have added Cygolite TridenX Li-Ion Xtra headlights that have never failed to get drivers attention even in broad daylight! Using those with the bright and colorful “flags” we fly and the bright flashing tail lights we use makes us very visible to fellow commuters in their “cages”. I’ve had more than my share of co-workers mention that their attention was drawn to my lights and flag well before they even realized the light was coming from a trike as they passed me on the way to work. At night the reflective trim on the Axiom bags more than makes up for the harder to see flag. In fact, when I’m following my wife who has the same exact set up, the reflection of my headlight off of her Axiom bags is so bright it’s almost blinding. 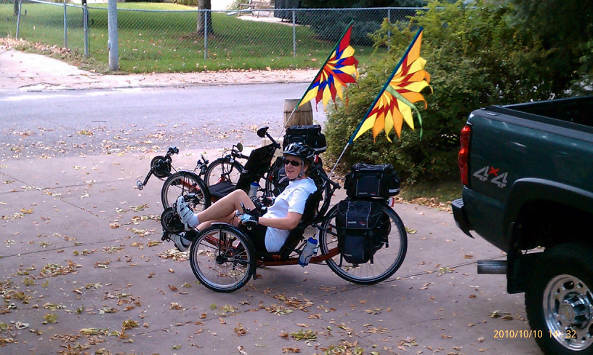 We haven’t yet taken any long trips on our trikes, the longest of our rides have been 40 to 50 miles, but who knows what we’ll do next! We put them up when the snow started to fly this winter as we didn’t want to get them covered in slop and road salt, but I’m planning on getting them down and taking them to an area bike path for some winter riding in some fresh snow when the opportunity presents itself. Anyway, thanks for taking the time to read my story!